The Halifax Township Supervisors and Employees would like to say "Hello" and "Welcome to Halifax!" 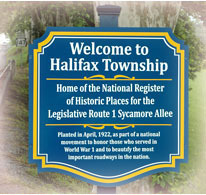 This website is designed to be your portal to information about Halifax Township's Government, Events and History. We have also provided a section with links to several other useful sites. Avoiding Scams and Identity Theft examines how identities are stolen or compromised, what you can do if you find you have had your identity stolen, and how to stop theft from occurring. This will be held April 22 from 1:30 to 3:30 at the East Shore Area Library. Look at the attachment for more information. Clean Up Days for Residents of Halifax Township and Halifax Borough will be Friday, May 10 from 7am to 3pm and Saturday, May 11 from 6am to Noon. See attached for more details. South Central Alert System is an alert system that people in our borough may sign up for! You may already accept alerts from Halifax Borough, Halifax Township, and Halifax Water and Sewer! Our organizations have signed on to Everbridge and South Central Alert System to give you the latest updates in an easily accessable manner. Residents of Halifax Township may take their electronics recyclables to the Upper Dauphin County Electronics Recycling Event which is located at the Upper Paxton Township Building every 2nd Saturday of each month from 9:00 am until noon. Click here for more information about the procedure to request information from Halifax Township. State Senator John DiSanto's staff will hold office hours at the Halifax Township Building, 102 Fisher Street, on the 2nd and 4th Tuesdays of each month, from 9AM - Noon. Please feel free to stop by with any issues, concerns or requests for assistance related to state law or agencies. You may also contact Senator DiSanto at www.SenatorDiSanto.com or 717-787-6801.